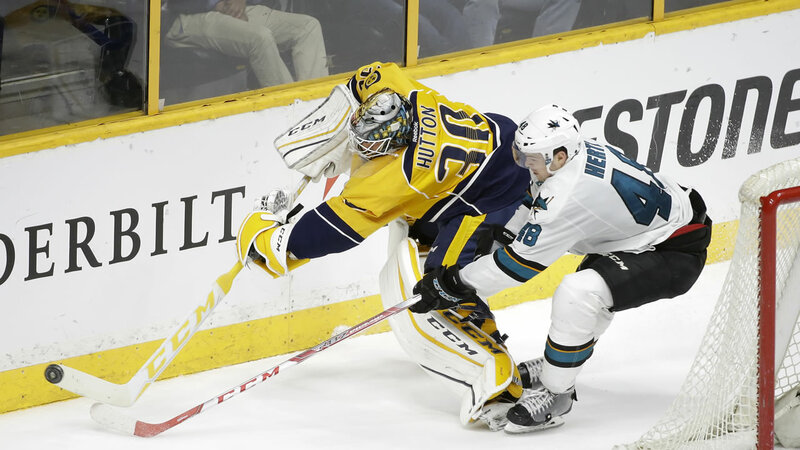 NASHVILLE, Tenn. -- Logan Couture scored the only goal of the shootout to lead the San Jose Sharks to a 3-2 comeback victory over the Nashville Predators on Saturday night. Tomas Hertl scored a pair of third-period goals and Joe Thornton assisted on both for San Jose, winners of three of four. Shea Weber and Calle Jarnkrok had the goals for the playoff-bound Predators, who have lost four straight. Despite the skid, Nashville clinched its second consecutive playoff berth Friday night when the Washington Capitals defeated the Colorado Avalanche in regulation. In the shootout, Couture slipped a quick wrist shot from the slot between Carter Hutton's pads. Hutton had 38 saves in regulation and overtime. Weber scored the game's first goal at 8:07 of the opening period. From the right boards, Mike Ribeiro sent a pass to Weber, who was coming down from the right point. Weber stepped into a one-timer and beat James Reimer high to the stick side just underneath the crossbar. Reimer finished with 28 saves and denied all three Nashville attempts in the shootout. Ryan Johansen appeared to make it 2-0 as time expired in the first period, but his shot, which was called a goal on the ice, was overturned on video review as not having completely crossed the goal line before the clock hit all zeros. Jarnkrok did make it 2-0 at 1:38 of the second when he redirected James Neal's shot from the high slot between Reimer's pads. Hertl cut Nashville's lead in half at 2:19 of the third. The goal was Hertl's 20th of the season, the fifth Sharks player to hit that mark this season. He then tied it at 10:31 of the third when he redirected Brent Burns' slap shot by Hutton.